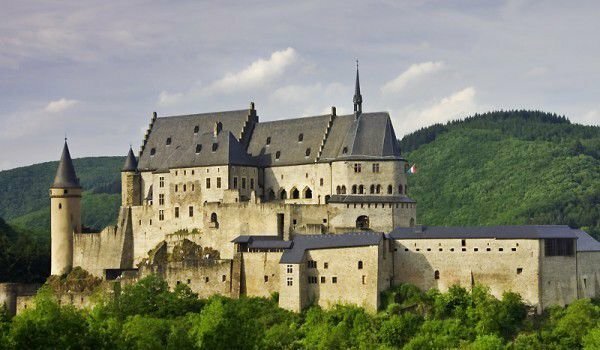 Vianden Castle is one of the most fascinating castles in Luxembourg and one of the largest and most impressive in Europe. Vianden is located in north-east of Luxembourg, in an area known as the Ardennes. This massive palace rises majestically on a steep wooded cliff, which dominates the valley, which in turn flows through the eponymous river. The view from the hill of Vianden is really fascinating. Along the river and across the valley there are several camping and recreation areas because the area of the castle is a favorite spot for weekends for many locals. Before you reach the castle on the hill you will see spectacular views, which opens the way to it, which departs from the eponymous town of Vianden. The majestic palace was built over a long time from 11th to 14th century and on the site of an earlier Roman fortress, which was the Carolingian refuge. Today Vianden is a unique make up of medieval and Gothic architecture. In the 13th century when the palace was the seat of the ruler Henry I Vianden reached its zenith. The main parts of the castle, have managed to be maintained up to today. The chapel and small and large parts of the palace were built sometime in late 12th and early 13th century. Once in the 14th century the so-called lodging of Julien - Quartier de Juliers, was located on the west side of Vianden, but today there is not much left of it to be seen. The House of Nassau was constructed in the early 17th century. In recent years, the castle underwent a major restoration, after which it turned into a museum which is open year round for public visits. In 1862 and in 1865 Victor Hugo arrived in Luxembourg and in 1871 he spent a long period in the Vianden Castle . Today some of his works from that time are set in the house to the bridge over the river, where back then the writer was staying. In Vianden there is the Museum of Arts and Crafts, and there is also an interesting exhibition in the museum of dolls and toys.